There’s a law that means there’s one carer for every four toddlers in childcare. But in aged care, there are no staff ratio laws to protect elderly Australians like Ruby. Our nurses and carers do an amazing job, but they need your help. Go to http://timeforruby.anmf.org.au/ to let your federal politician know that they can’t ignore the issue any longer. We need staff ratio laws for aged care NOW. Nurses, doctors, carers, over 300,000 community members and a growing number of politicians agree: We need guaranteed numbers of staff and skills for aged care. This election vote for the candidates who will protect our elderly. See which politicians have pledged their support for ratios in aged care. For more information about the Royal Commission into the aged care sector, how to make a submission and to get the latest updates from the ANMF as we prepare our own submission, go to our Royal Commission into Aged Care Quality and Safety update page here. The ANMF is conducting a second national survey to give nurses and carers the opportunity to shape the future of Aged Care in Australia. Your concerns, experiences and views of working in the aged care sector are critical to making positive changes in the future. Read more. Go to the Campaign Resources page to view Campaign Videos, download Fact and Information Sheets and Posters to get involved and spread the word about the campaign. That’s why nurses and doctors have joined forces in calling for aged care ratios. 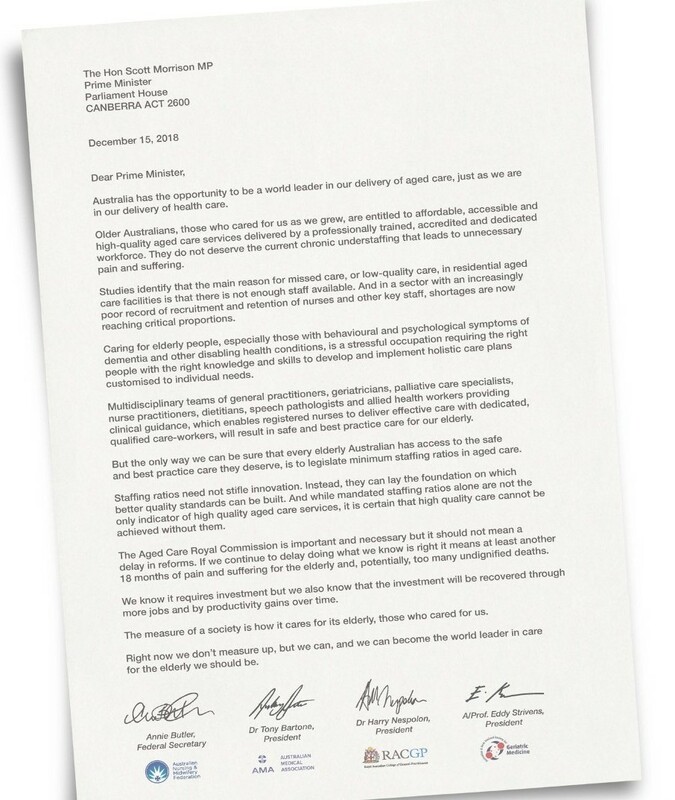 The ANMF, the AMA, RACGP and ANZSGM published a letter in The Australian newspaper calling on Prime Minister Morrison to legislate minimum staffing ratios that will enable the delivery of the holistic care plans needed to ensure safe and best practice care for all elderly Australians. Read the full letter here. The Australian Nursing and Midwifery Federation (ANMF) has released compelling evidence which outlines how mandated minimum staffing ratios in aged care can be implemented to bring improvements in care outcomes for elderly nursing home residents while also providing economic benefits. Independent economic analysis, undertaken by the Flinders University’s Australian Industrial Transformation Institute (AITI), not only outlines the financial benefits of implementing mandated minimum staffing levels for the care of the elderly but also warns of the ‘significant costs’ of not mandating the minimum levels of nursing and care hours in nursing homes. Over the last 13 years, chronic understaffing has seen a 400% increase in preventable deaths of elderly Australians in aged care with hundreds dying from falls, choking and suicide. They are our parents and grandparents, people who looked after us and loved us, but now many of them, especially those in need of high care, are left unfed, unwashed and even in soiled nappies for hours. Hard-pressed nurses and care staff do the best they can in impossible circumstances, but they are run off their feet and can’t provide the care they want to. And while our nurses and care staff struggle because there is simply not enough of them, last year*, owners of Aged Care facilities racked up over $1 billion in profits while cutting staff. Australia has strict staff ratios for childcare, which is as it should be. But there are no ratios for aged care and no laws to ensure our elderly get the care they need. It’s a crisis that shames us. Our Aged Care system has been ignored by governments for far too long. *that all indications from major for-profit and non-profit company reports continue to show further increases in profitability in the 2016-17 financial year. Currently aged care residents are receiving around 2.86 hours of care per day from nurses and carers, which is nowhere near enough time to shower, toilet, medicate, dress, feed, roll over, move, let alone talk to a resident. The evidence shows residents should be receiving a minimum of 4 hours 18 minutes of care per day - one and a half hours more than they are getting now. Ratios for Aged Care. Make Them Law. Now. Ensure that billions of dollars in taxpayer funding to for-profit aged care providers must be invested in caring for our elderly rather than earning profits for shareholders. Authorised by A.Butler, Federal Secretary, Australian Nursing and Midwifery Federation, Level 1 / 365 Queen St, Melbourne, VIC 3000. The ANMF is a federation of strong and active Branches in every State and Territory in Australia with over 258,000 members.